Here is some information that may be useful for anyone wanting to do the Tour de Mont Blanc by bicycle. The article on my ride is here: Tour de Mont Blanc. 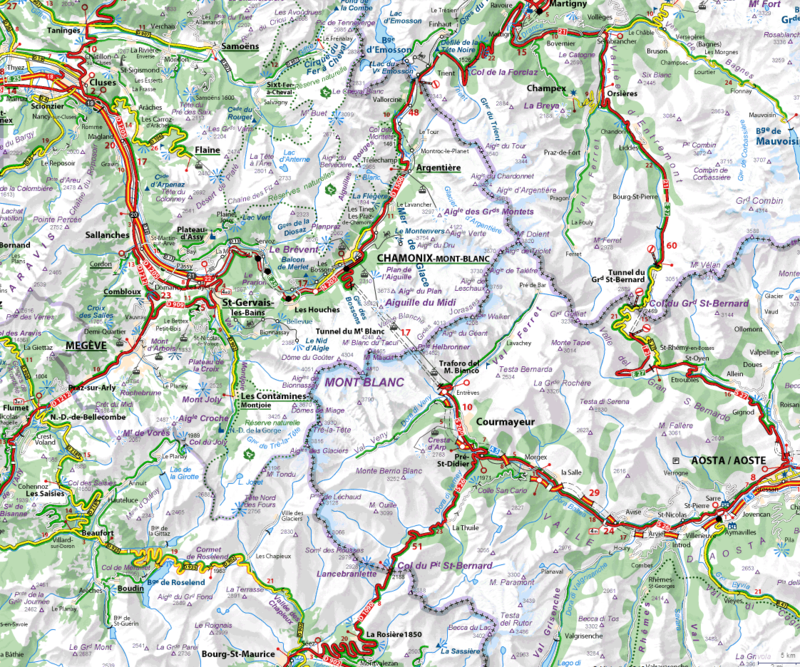 The route takes the roads that run closest to the Mont Blanc Massif so it includes an additional, but nice, climb to Champax (in the north-east part of the circuit). The first thing to think about is where to start and finish and how many days to take. I started in St Gervais as that was where we were staying; it worked well as we wanted to have our overnight stop on the top of the Col du Grand St-Bernard. Other good options could be starting in St Gervais or Le Fayet and spending a night in Aosta or, if you wanted to do it over three days, starting in Chamonix and staying a night on the Col du Grand St-Bernard and in Beaufort. In terms of direction, I went clockwise because that is the direction that the one-day Tour de Mont Blanc takes, but the other direction would be good too. 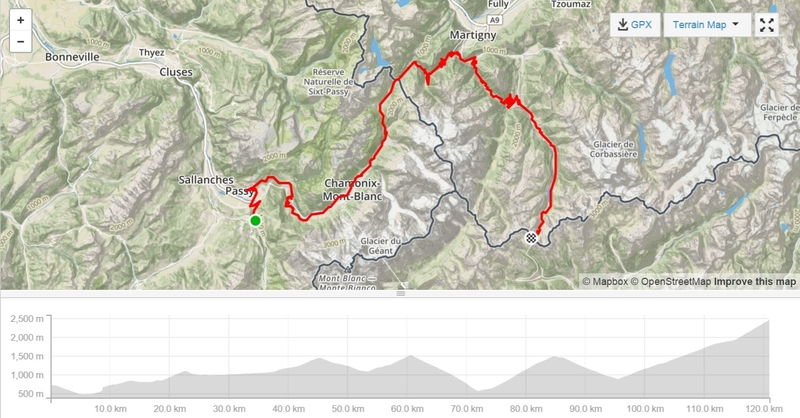 The only consideration would be that climbing the Grand St-Bernard out of Aosta (which is on the main road) is probably a less pleasant climb in that direction. Finally, I was lucky enough to have car support for the first day and the start of the second. Many thanks to my wife! The main thing about not having this is probably having to carry additional clothing and whatever you need for an overnight stay. An extra layer of warm clothing and long gloves, particularly for any descents you are going to be doing any in the early morning (e.g. descending the Col de Grand St-Bernard). Lights. You could get away without them in the tunnels but the route is long enough that you could be riding at night. Passport. However I think it is very unlikely you would be asked to show it. The sections of each of my two days of my ride are described in more detail below. Follow the side road (D13) to Servoz. This is a nice quiet road. Where is crosses the main dual carriage-way towards Chamonix follow a very small road up multiple hairpins to Vaudagne. It feels off route and that you are climbing further than you need to; although you do have to drop about 100m into Les Houches it is the only way to avoid the main road. It’s then possible remain off the main road all the way to Les Praz which is beyond Chamonix. This section is quite easy and the climb to the Forclaz is only 400m. There are some great views of Martigny and the valley beyond and it is a good, fast descent. When you get to a junction (signed to Le Brocard) you can cut off the corner off with a steep descent (not so good for coming up) through some small villages and vineyards. It’s then a short ride on the main road to Les Vallettes and the turn off to Champex. Note that Les Vallettes is a tiny place with no obvious shops or cafés so don’t count on stocking up on food and water. The climb to Champex is on a nice, picturesque road. The eponymous lake and the descent from Champex is really pretty, but is followed by a long 20km climb (quite steep in places at 7-8 percent) up the main road. This is quite wide and felt safe even in the tunnels and galleries. There is a way round the only dark tunnel. The galleries (there are several kilometres of covered sections) are bright but very noisy and initially unnerving when traffic goes by. The final part of the climb from the tunnel to the Col du Grand St-Bernard is quiet as it is only used by cars going over the pass. It is a nice climb with some great views especially from the top. 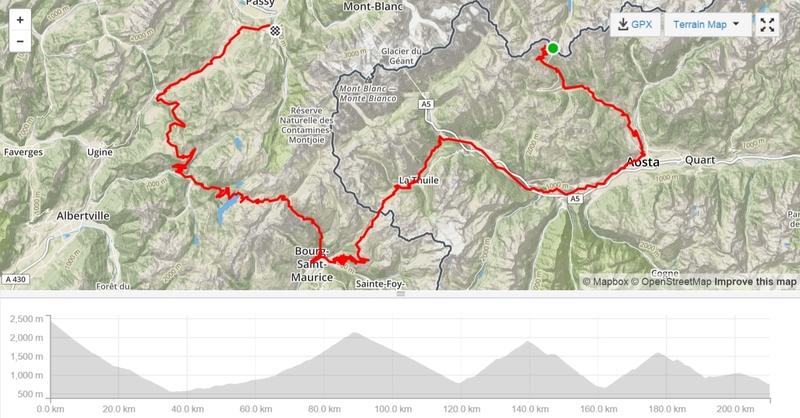 This is a 90km section starting with a long descent into Aosta. Once the road from the pass meets the tunnel road it is busy but generally quite wide. Make sure you follow the signs for the SS26 as you approach Aosta. There are then some busy kilometres through what is basically a large town before things quieten down for the gentle climb towards Courmayeur. There are some forts and some views of Mont Blanc to look at but it’s a bit of a drag. There are also some tunnels on this section of the road, although you could get away without having lights as they are not that long and generally well lit. Pre St Didier is a nice place to stop and fuel up before the proper climbing to the Col du Petit St-Bernard begins. After 10km you pass Les Thuilles which would also be a good place to stop. The top section of the col is pretty bleak although on a clear day there may be some good views of the Mont Blanc range. The descent to Bourg St-Maurice offers some great views tempered by the realisation that one has to lose all that height. It is 31km in total so takes almost an hour. It’s worth noting that the route passes a McDonalds in Bourg (the only one directly on the route! ); alas I had already bought a sandwich before I got there. Bourg is a large, not particularly picturesque town but that all changes with the climb to the Cormet which is varied and interesting and is on a good, quiet road. It’s almost a joy to ride up. The descent is even nicer, first taking you to a high reservoir and then down into the bottom of a steep wooded valley where you eventually reach Beaufort. (The image for this post is looking down the valley to Beaufort.) This is in my view the nicest looking town on the route and would be a good place to stay. The climb to Saises and just past it to the col is also beautiful on a quiet road crossing hamlets and meadows. Saisies itself is quite a large modern ski resort. Not so pretty but definitely somewhere where you could buy food. The descent from the col is as pretty as the climb and takes you to the main road to Megève. There is then a 20km ride along this but it’s not that busy a road and whilst there are some small uphill sections it is not hard compared with the rest of the route.